Good morning, fellow Salon Members! We've had a couple of lovely days, some almost in the 50s, here but a winter storm warning is on the horizon... Winter has not left us yet! The reading slump. We've all been there, when you just can't find the right book to fit the day or mood, where nothing seems to be holding your interest. I sit here, looking at my poor neglected bookshelves and my poor neglected blog and my poor neglected Mt. TBR and I yearn to read, yet nothing calls to me. I'm heading on vacation in early March, and while that is going to do nothing more than put even that much farther behind, I'm anxiously waiting to get my batteries recharged. I need a break from life, and while books usually do that for me in small quantities, I think I need a larger recharge dose right now. So yeah... I'm behind. And so early in the year, too! I'm going to have to do some serious reading in the coming months to help me catch up to my goal for the year. Do any of you ever suffer from the reading slump? What do you do to break it? Read an old tried and true favorite? Read brain candy? Take a break? Stop by and leave us your reading slump remedies! So, today I had the pleasure of finally meeting, in person, the fabulous Courtney Allison Moulton, author of Angelfire. We had been Twitter-introduced by my friend Gail (we missed you today, Gail!!) and have been chatting for a couple of months now. 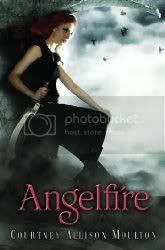 I was able to download her debut novel, Angelfire via NetGalley and really liked it. 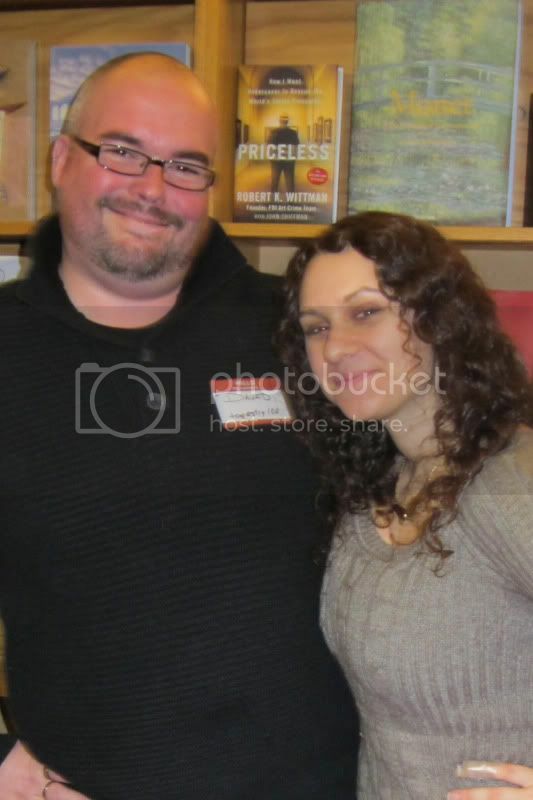 The launch party for Angelfire was hosted at my local Schuler Books and as usual they did a fantastic job. Given that Courtney is a local author, she had quite a following there between friends and family and the good news is the store sold out of their stock of books! They had cookies and root beer floats for everybody and Courtney brought swag bags to give out. Overall, I think everybody had a really great time out supporting Courtney! If you want to read more about Courtney and Angelfire, visit her website at www.courtneyallisonmoulton.com. Clarity will be released on March 1, 2011 from Point, an imprint of Scholastic. Courtney Allison Moulton's Angelfire is released today!! Be sure to pick up this great debut book today. 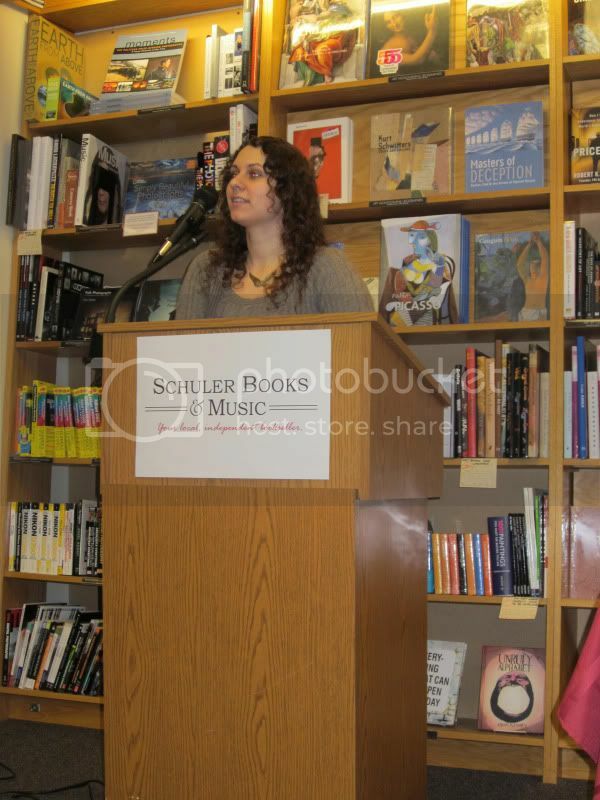 Or better yet, stop in to Schuler Books at 2820 Towne Center Blvd, Lansing (off Lake Lansing Rd), this Saturday, February 19, 2011 at 2pm and meet Courtney in person and get your book signed! Courtney Allison Moulton's debut, Angelfire, is a fast-paced, action-packed thrill ride of a book, with a little side of romance thrown in for good measure. Ellie, who is just about to turn seventeen, has been experiencing nightmares of creatures who are hunting and killing her, nightmares so realistic they almost seem to verge on memory. But, they're just nightmares, right? No harm can from them, right? She keeps thinking that, until she meets one of the creatures while she's awake. And the mysterious boy, Will, who comes to her rescue that night may just hold the key to her memories and who and what she is, because Ellie is actually more than she knows. The creatures hunting Ellie are reapers, and they've actually been hunting Ellie for centuries, and Will has been her guardian for centuries. In turn, Ellie has been hunting and killing reapers for centuries, as well. How and why Ellie has been around for centuries, and why she can't remember these centuries, is all part of the mystery of who she truly is. Courtney Moulton has created a heroine in Ellie who may seem a little too frail and unsure of herself at the beginning, but who grows into her own as a strong and forthright protagonist. At the beginning of the book, I just assumed that this was going to be your typical YA paranormal romance with your mystical being du jour (in this case, angels). I have to be honest, I enjoyed the opening of the book, but slowly grew to dislike Ellie as a whole. She seemed a little too whiny for my liking. However, I started to really think about it. Ellie just turned seventeen. She's still in high school, and she just discovered that she's a centuries old killing machine. But right now, she's still just seventeen (How is she centuries old and just turning seventeen at the same time you ask? Read the book and find out!) She's still just figuring out who she really is as a person, not just this killing machine. So of course, she's confused and is a little against the whole idea of having to be this thing that she doesn't want to be, and just wants to be a normal teenager. Once I came around to her understanding of who she is versus who she wants to be, her behavior seemed so much more in line with her teenage self. Add in the possible attentions of two different boys, and you have yourself a girl with a lot on her plate, all at once! There is plenty of adventure in this book. There are several fight sequences between Ellie and the reapers, and they are very detailed and highly choreographed. In fact, there seems to be almost no let up on Ellie with the fighting, and you begin to wonder if the poor girl is ever going to have a chance to catch her breath! The mythology that Moulton is creating with Ellie and the reapers and angels is quite unique and I really love how she is working in so many time periods into Ellie's past. For a debut book, Moulton is certainly packing quite a bit of research and information into her book and making for a really interesting read. So, long story short, Moulton completely won me over with her writing and her characters. This is a strong debut from an author that I am anxious to see more of in the future. Meg Waite Clayton’s national bestseller The Wednesday Sisters was a word-of-mouth sensation and book club favorite. Now the beloved author is back with a page-turning novel that explores the secrets we keep, even from those closest to us, and celebrates the enduring power of friendship. Mia, Laney, Betts, and Ginger, best friends since law school, have reunited for a long weekend as Betts awaits Senate confirmation of her appointment to the Supreme Court. Nicknamed “the Ms. Bradwells” during their first class at the University of Michigan Law School in 1979 — when only three women had ever served full Senate terms and none had been appointed to the Court — the four have supported one another through life’s challenges: marriages and divorces, births and deaths, career setbacks and triumphs large and small. Betts was, and still is, the Funny One. Ginger, the Rebel. Laney, the Good Girl. And Mia, the Savant. But when the Senate hearings uncover a deeply buried skeleton in the friends’ collective closet, the Ms. Bradwells retreat to a summer house on the Chesapeake Bay, where they find themselves reliving a much darker period in their past — one that stirs up secrets they’ve kept for, and from, one another, and could change their lives forever. Once again, Meg Waite Clayton writes inspiringly about the complex circumstances facing women and the heartfelt friendships that hold them together. Insightful and affecting, The Four Ms. Bradwells is also a captivating tale of how far people will go to protect the ones they love. 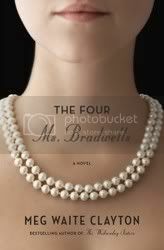 The Four Ms. Bradwells will be released on March 22, 2011 from Ballantine Books. You can also read more about The Four Ms. Bradwells here. Doctor Grordbort Presents: Victory - Scientific Adventure Violence for Young Men and Literate Women is the year's foremost journal of progressive armaments and weaponry! Behold the latest line of defense captured in action! Filled to the brim with firsthand tales of exploration and progress from the great heroes of our time, picture strips of unimaginable escapades on the frontier, never-seen-before portraits of dazzling damsels and monstrous villains, and laudable accounts of man and robot pitted against our greatest enemy (the uncivilized world), Victory is an onslaught of action-packed scientific adventure in full-spectrum color - containing facts that every boy and literate girl should know. What mysteries and marvels will he uncover? Golly, it's so exciting thinking about it that I've just peed myself a little. Read on! 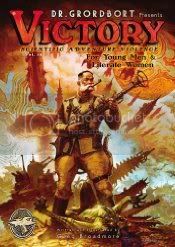 Dr. Grordbort Presents: Victory - Scientific Adventure Violence for Young Men and Literate Women reads like a scientific journal of a time long passed that hasn't happened yet. In this retro-futuristic world, we have traveled to Mars, Venus & the Moon and have discovered the varied and sometimes dangerous inhabitants of these planets. The hero of our tale, Lord Cockswain, basically blunders his way through one adventure after another, always seeming the hero even though it is the circumstances surrounding him and his ignorance that proves otherwise. The entire thing is entirely told tongue-in-cheek. There are advertisements for Dr. Grordbort's latest ray guns, advertisements for the latest military weapons, advertisements to encourage young men to join the military and explore the solar system, tales of the adventures of Lord Cockswain. I found myself laughing several times throughout the book. In direct contrast to the over the top writing is Greg Broadmore's gorgeous art. Broadmore works at the Weta Workshop (you know, the people behind the Lord of the Rings films) and has worked on such films as District 9, King Kong and The Chronicles of Narnia: The Lion, the Witch and the Wardrobe. His artwork throughout ranges from the slightly silly to downright engaging. It's this contrast of such striking art and comical writing that makes Dr. Grordbort Presents: Victory such a fun book to read. In a world inhabited by anthropomorphic animals and where France wins the Napoleonic War, Britain falls under French rule until after decades of civil unrest, Britain frees itself from France and becomes the Socialist Republic of Britain. 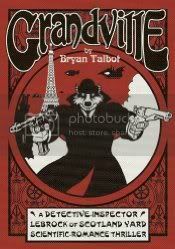 After the murder of a British diplomat that is made to look like a suicide, Detective-Inspector LeBrock of Scotland Yard and his assistant Detective Ratzi go on a mission to discover the real culprit and uncover a conspiracy that lies far deeper in the French government than anyone could believe. Detective-Inspector LeBrock (a badger) is quite clearly modeled at least partially after Sherlock Holmes and his assistant Ratzi (a rat) after Watson. In this alternate history, the world is not only inhabited by animals (and a very few humans, referred to as "doughfaces") but steam technology has progressed to an advanced degree, clearly making this graphic novel Steampunk inspired. Bryan Talbot's art is dark and gritty and his writing is at turns clever and witty. There has been a second volume released featuring DI LeBrock and I think I would like to check that out at some point. While this is a graphic novel, it can be very violent and adult in nature, so I wouldn't recommend it to a younger audience, but for adults who enjoy a good mystery and aren't turned off by too much violence, I'd say give this a chance. Want to enter an awesome contest and win a one of a kind book? Of course you do! 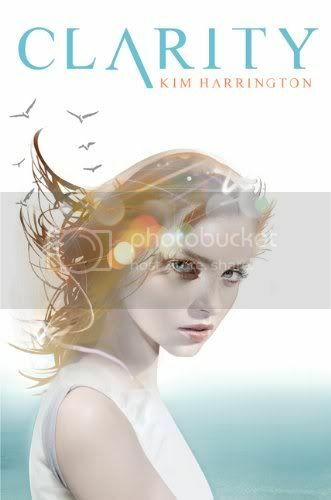 Just stop over to Kim Harrington's blog to find out all the details! Brooke McEldowney may be one of the funniest cartoonists out there. His razor-sharp wit and his character's equally razor-sharp dialogue combined with his fluid, organic art style makes for one the freshest, most clever, most visually appealing reading experiences one can have with a daily comic strip. His stories can be at turns touching, laugh out loud funny and cuttingly sarcastic. In so few words, I love it. I originally discovered McEldowney's work through his strip, 9 Chickweed Lane. What caught my eye immediately was the art. I don't even know how to describe it except that it seems to literally flow. I've seen his rough sketches and it's like one continuous swirl that comes to life and creates his characters for him. I lost track of his strip for a couple of years, but thanks to the wonder that is the internet, I re-discovered not only 9 Chickweed Lane, but found that he had started another online strip called Pibgorn. 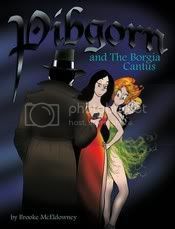 Pibgorn is a fairy who is in love with a human and whose best friend is a homicidal succubus. I found my way into the Pibgorn world a little late, so was already behind-the-times when I started reading but quickly got caught up in the story and was loving every minute of it. You can imagine my pleasure when I also discovered that the Pibgorn strips were going to be reprinted as collected editions! It's been fun watching the characters grow and take shape and come into themselves. 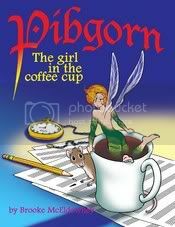 The Girl in the Coffee Cup introduces us to our three main characters, Pibgorn, Drusilla and Geoff and sets up their relationships with each other. 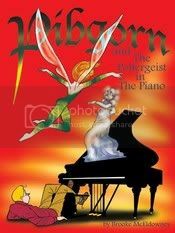 The Poltergeist in the Piano sends Pib and Dru on a time traveling murder mystery involving a vampire. In The Borgia Cantus, Dru has been keeping the demons that she's been vanquishing hidden, that is until Pib unknowingly unleashes their forces on NYC. The characters aren't entirely themselves yet, but you can definitely see the potential of these characters. I'm really hoping that further editions of Pib and Co's adventures are released. For more information on these and potential future Pibgorn editions, visit Pib Press.